Our last full day in Queenstown turned out to be a little frustrating in the beginning. We needed to make arrangements for getting to the start at the Routeburn Shelter and back again from The Divide. We had discovered a service called Track Hopper, which collected your car from the starting point and delivered it to your finishing point for $250. Unfortunately, nobody answered the phone when I tried to book them so we trudged all the way up a long hill to their address to discover they had moved, not far, just a few doors away but neither property seemed to be occupied despite doors and windows being open! In the end we booked a shuttle bus to take us to the start at Routeburn Shelter and combined our return from The Divide with a trip to Milford Sound and a cruise. Logistics sorted, we went next to Westpac, the bank we were recommended to patronise as it had relations with Barclays. We had had a couple of tricky moments trying to get cash out of the hole in the wall and I had also received a couple of suspect emails, supposedly from Barclays, something which has not happened before. We just wanted to make sure that our account had not been compromised. They were less than helpful in Westpac and really did not care two hoots if our account had been compromised. I left in a not very good mood, which unfortunately hung over me for the rest of the day. In the afternoon we took the TSS Earsland, a 100 year old steam ship which ploughs up and down Lake Wakatipu. As beautiful as the ship is it could not improve my mood. I had fallen out with Queenstown and the hoards of tourists who block the streets and behave like flocks of sheep. The lake is beautiful but the ship does the same journey on a two hourly cycle from 10.00am to 8.00pm. It seems strange that only does this short run when the lake is so much bigger. Still in a grump we took the gondola up to Bob’s Peak, overlooking the town and lake. Again, it was very beautiful, and there were a whole range of activities for young and old alike, from a dry luge run to mountain biking, from paragliding to a really scary bungee jump down the cliff face with only rocks rushing up to meet you. The following morning I felt much better; we were going to get away from the crowds and head off to the Routeburn. Packed and ready with food for five days, we had a leisurely, large breakfast to give us energy and to make up for the five days of rations we were imposing on ourselves. At 12.15 we boarded the minibus to the Routeburn Shelter via Glenorchy. It was a beautiful journey along the shore of Lake Wakatipu in warm sunshine and, we were assured, a good forecast for the next few days. The lake proved to be much bigger than I first thought. Glenorchy is in a beautiful setting but is one of those ‘almost at the end of the road towns’ that appears to have very little going for it. However, when people talk about it they speak very affectionately about it and the café, the pub and all those places we never saw. We had stopped opposite the school while the children were on break. There were about ten of them playing with about five adults supervising, not very well, as four of the children climbed over the fence into the road to talk to a chap on a bike. Having been dropped off at The Shelter we set off for the Routeburn Flats Hut and our first night’s accommodation on the trek. We immediately found ourselves walking through a forest of red beech trees on a well-constructed and maintained path. The path climbed steadily and our breathing was accompanied by bird song and the sound of roaring, tumbling water below. Whilst the path was well maintained, the forest was beautifully natural. The trees were not manicured in any way. As they matured, bits dropped off and were allowed to rot naturally. Whole trees fell and were consumed by the forest floor of mosses and young trees eager to take the place of their ancestors. The variety of greens on the forest meant that our interest never waned and the birds were always very entertaining. They seemed to have little fear of us, from the Riflemen, extremely small, almost tailless birds, which darted about the lower branches close to the ground, chattering loudly, to the Black Robin who would jump on to the path in front of us like a highwayman and confront us. If we stood still his fear would diminish totally and he would jump on to our boots and peck away at our laces. One jumped onto my camera case hung around my neck. It is wonderful to have such close contact with these birds, which display an innocence and trust that birds in the UK have lost, unless we spend hours and hours patiently developing their trust. As the afternoon mellowed into evening we arrived at the hut, which had the capacity to sleep 26 but, as it turned out, only had 12 for the night. The hut basically consisted of two dormitories with bunk beds, a kitchen a dining area and loos outside. It was comfortable enough, particularly as it was only half full. The windows look out onto a flat meadow (hence the name Routeburn Flats) with a meandering stream, the Routeburn, flowing through it. On the other side the forest rises up to a snow-capped peak, which glowed in the early evening sun. The evening was spent chatting to the other ‘trampers’ and meeting the warden, Liz, a diminutive woman committed to her role as warden of the hut and the surrounding environment. It soon became clear that some of those we were sharing with on this first evening we would be spending subsequent evenings with, while others, travelling the route in the opposite direction would not be seen again. At 8.30 the following morning, Liz posted the weather forecast on the board in the hut. It did not make for very encouraging reading. While it was fine now, it was soon going to deteriorate and rain would be spreading in. This would also mean low cloud, obscuring any possibility of good mountain views. The outlook did not look good either. 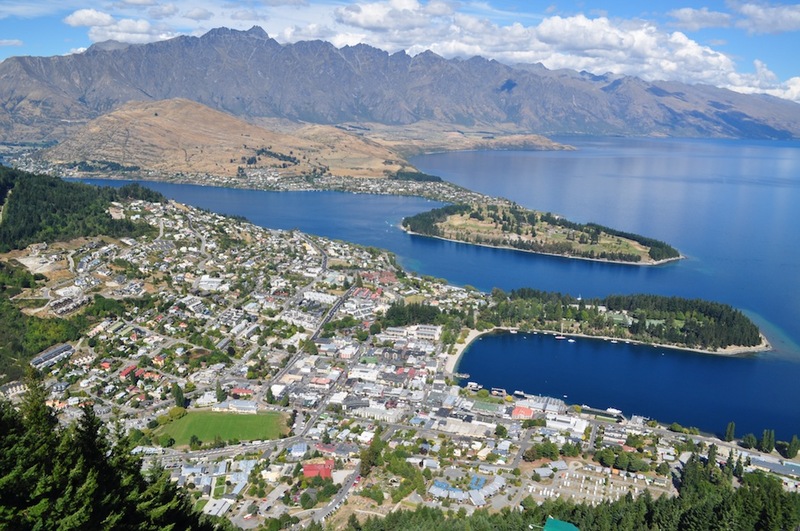 Having had encouraging weather forecasts in Queenstown, it was soon becoming apparent that what applies to other parts of South Island, certainly does not apply to the rain forests of the Aspiring and Fjordland National Parks. If we got a move on we might arrive at the Routeburn Falls Hut before the rain sets in. Before we left we chatted to Liz to discover that she had something in common with me, in that she knew some of the personalities involved with the Himalayan Trust and had been to Nepal to visit friends running the hospital at Kunde. What a small world! The walk up to the Routeburn Falls Hut was much of the same, only the path was significantly steeper. 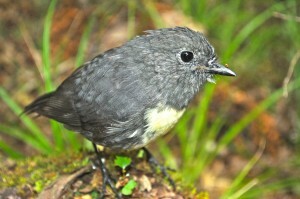 The Robins still ambushed us on the path and each time they became more confident than the previous encounter. Luckily we arrived at the hut before the rain. This hut is much bigger, being able to sleep more than fifty trampers. Hence all the facilities are much more extensive. They are really well though out and are incredible structures considering the environment. This building is largely built on stilts because of the gradient of the ground beneath. Others began to arrive and fill up the bunks. We decided, despite the rain, to take ourselves for a walk to Paddy’s Point, a rocky summit above the hut and about an hour’s walk away. This took us up, past the waterfalls after which the hut is named, and on to a side track, climbing steeply to a flat rocky summit. Had the weather been good, we would have had fantastic views. As it was our eyes were drawn to the view below as the clouds obscured anything interesting above. We could see beyond the Falls Hut down to the Flats and beyond. Despite the rain, it was an enjoyable and worthwhile outing and broke up the time we would spend sitting in the communal areas of the hut. When we returned there were more new arrivals and inevitably we were drawn to those we had spent the previous evening with, namely three Australian women and three Kiwis from North Island. The more we chatted, the more we enjoyed their company. A Kiwi turned Aussie, Paulette, who had recently been trekking in Nepal, also joined us. Three Americans, two astrophysicists taking a break from working in the Antarctic on microwave telescopes, and a girl also made interesting conversation. The following morning was still damp and we were shrouded in cloud so there was absolutely nothing to see. Keith, the hut warden put up the weather forecast for the day at 8.30 and it promised to clear as the day progressed. We delayed our departure a little to allow the clearing process to begin. The walk today was above the forest line and would have been stunning if the views had been forthcoming. As it was it remained very misty for the two hours it took for us to climb up to the Harris Saddle. 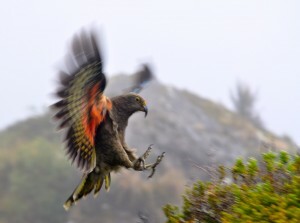 The only entertainment we had on the ascent was from a group of about six Kea who were playing at the side of the path. 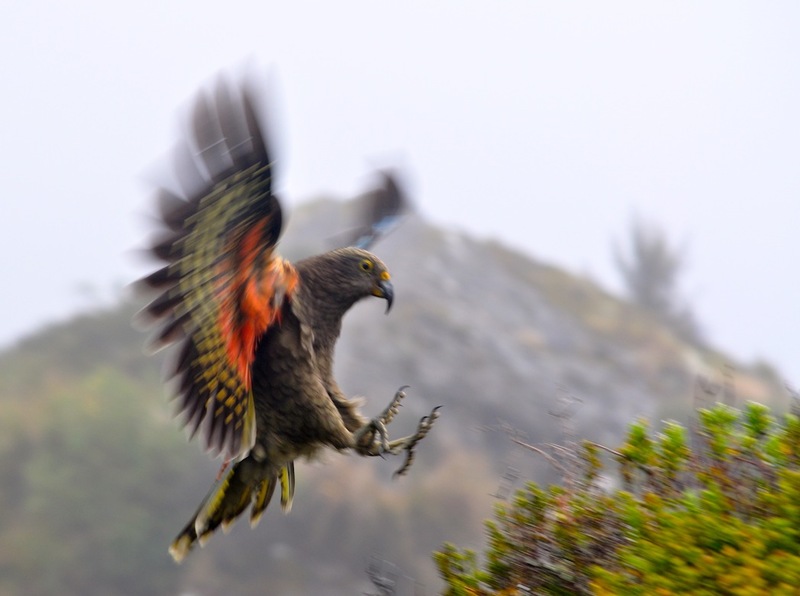 They would allow us to photograph them before flying off to a point about 200 metres up the path where the same would occur again, and again. From Harris Saddle we could just about make out Lake Harris below but it looked nothing like the pictures of bright sunshine glistening on pristine blue waters in the brochures. At the Saddle Shelter we stopped for a break and it was clear that the weather on the other side was significantly better. There were patches of sunshine and blue skies giving us some hope of a pleasant walk down to the Lake Mackenzie Hut. However, before that could happen I had to make the decision as to whether to climb Conical Peak first. It was not hard to decline the opportunity as it was obscured by cloud and it seemed it would only be worth climbing for the view. The enchanting Angela walking through the enchanted forest - or is it a Hobbit? 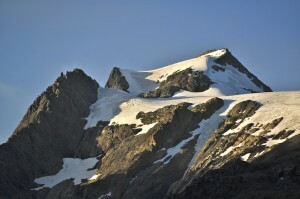 The Harris Saddle marks the boundary between the Mt. Aspiring National Park and the Fjordland National Park. We were descending into the latter, the largest national park in New Zealand. Having made a brief descent the path contoured around the hills for a long time. Despite the weather being better, the extensive views of snow-capped peaks and tumbling glaciers were not available and, without that interest, the walk became a little long and tedious. Eventually, we saw our target, Lake Mackenzie Hut, but it still took us an hour to descend into and through the forest to reach it. The forest on this side of the saddle is even more magical. The trees are Silver Beech but it is obviously even wetter on this side as the trees are covered in hanging mosses and the ground is swamped by moss. It didn’t matter that this was a boulder-strewn area, the trees grow at every opportunity and the moss just carpets everything. It really is an enchanted forest like the home of The Hobbit. Mackenzie Hut, nestling into the hillside on the shore of Lake Mackenzie is also a large one catering for over fifty trampers. We were really beginning to get to know our new friends and the more we got to know them the noisier we became. A handsome young man joined us in the evening. I know he was a handsome young man because Angela said so and she has impeccable taste in men! His name is Will and he is from Chepstow on a six-month journey around the world. He is a vet, between jobs, but what is remarkable about him is that he last worked in Bromsgrove with Tony Barnby, whose son, Tim, came to Nepal with me in 2002. What a small world! The warden at Mackenzie is a bit of a legend. Clive has been warden here for twenty years. Each evening the wardens give a safety talk and check everybody against a register. Liz, at Routeburn Flats did her job efficiently and told us, in addition to the safety regulations, interesting things to look out for. 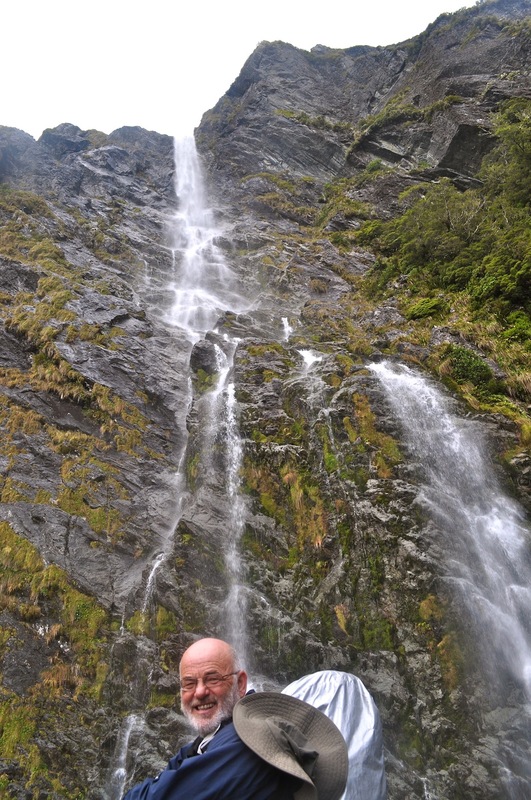 Keith, at Routeburn Falls, again was very efficient but was also quite amusing, particularly when talking about Clive. Clive does an hour-long stand-up routine with the fire procedures hidden within the routine. He is really very funny and the highlight of the evening. All his stories are based on his twenty year’s experience. The next morning the rain had stopped and the mists were rising out of the forests with the promise of a reasonable day. It was certainly the best of the five days we were walking. Climbing out of Mackenzie it was extremely humid but once we were on the level it all became a lot more comfortable. The walk continued through the enchanted forest with plenty of birdsong and tumbling waterfalls, including the magnificent Earland Falls, with a drop of 174m. The Howden Hut, on the edge of Lake Howden, has probably the prettiest setting of the four huts. The fact that the sun was shining might have influenced this opinion but to the front of the hut was like a garden with fruit blossoming trees, native shrubs and flowers and a host of chaffinches eager for a morsel or two. Being only an hour from the finish, or the start of the trek, whichever way you look at it, this hut is smaller, like the Routeburn Flats Hut. We settled ourselves in and waited in the sunshine for others to arrive. 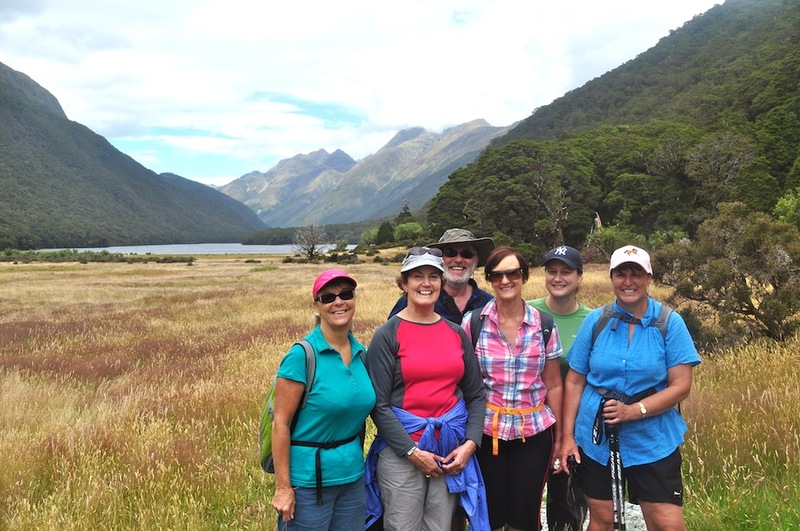 Soon the Kiwi women arrived and once they had settled we all went for a walk along the Greenstone Track for about an hour, when we got some superb views from a grassy meadow. As forecast, clouds were building and the sun soon disappeared and rain threatened. We got back to the Howden Hut just in time before the rain set in for the rest of the day and night. Our warden, this time was Jif (Geoff), a young lad with dreadlocks, who, unlike his counterparts at the other huts was not a great socialiser and felt a little uncomfortable in our company. Angela and I had been fairly frugal in our food consumption, not wanting to weigh ourselves down with too much to carry. For breakfast each day we had had a cereal bar, followed by another type of energy bar for lunch and a rehydrated meal in the evening. Having eaten our last meal this evening, and having only an energy bar each until the end of the trek, I began to imagine the pie I was going to eat at the first opportunity. Food dominated the conversation to the point that it became very silly. In the morning, I decided we should not eat our energy bars until we had finished the trek; not eating is much easier at the beginning of the day than it is at the end. It was still wet and the cloud was really low, so the excursion up to Key Summit was not really an option as we would not have seen anything and would have delayed getting my teeth around the energy bar. At The Divide we were able to change before we devoured our last bit of food. We were to be picked up by a bus to take us to Milford Sound, where we would be given a packed lunch once we were aboard the boat. However, we were not the only ones with food on our mind. As we waited for the bus, sandflies nibbled us wherever flesh was exposed and sometimes where it wasn’t. The insect repellent, including the one especially for sandflies, seemed to attract them more than ever. My mind was still preoccupied with the pies I was going to consume on the boat and Paulette, the Kiwi turned Aussie, and I found ourselves competing as to who was going to eat the most pies. Predictably, the bus was almost half an hour late, increasing the gastronomic tension. When it did arrive it was full of sightseers from Queenstown. The driver gave a commentary as he drove and occasionally he would stop for people to get off and take photos. Everybody got off like sheep took photos, mostly with inane people grinning and making stupid gestures with their fingers, while I sat on the bus with a grumbling tummy and an increasing desire not to be on the bus. I have to confess to the scenery being absolutely stunning with shear rock faces rising from the valley floor and waterfalls tumbling over the edges at every opportunity. 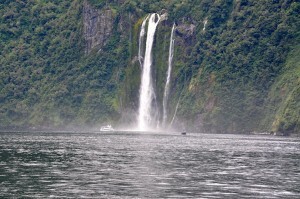 Eventually we arrived at Milford Sound, boarded our boat, Monarch, and received our packed lunches. It did not last long and sadly there were no pies for sale on board. Milford Sound is understandably a favourite tourist destination and everybody who visits South Island has to go there at some point in their travels. It is so worth it. It is one of the wettest places on earth, with up to 700cm of rain a year. With that record, you have to be very lucky to catch it on a perfect, sunny day. 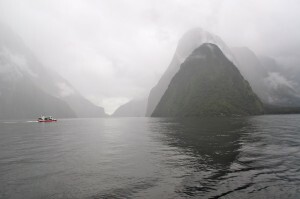 We didn’t, but even in the gloomy, and sometimes wet conditions we experienced in the hour and forty minutes we were sailing, it is a truly magnificent and stunning location. The once glaciated valley is now a flooded inlet with water 300m deep. Rising almost vertically from the dark waters are walls of rock, beautifully carved by the forces of nature with imaginative names like Mitre Peak and Lion Peak. Tumbling over these vertical drops were majestic waterfalls, streaks of silver and white, cascading into the sound. 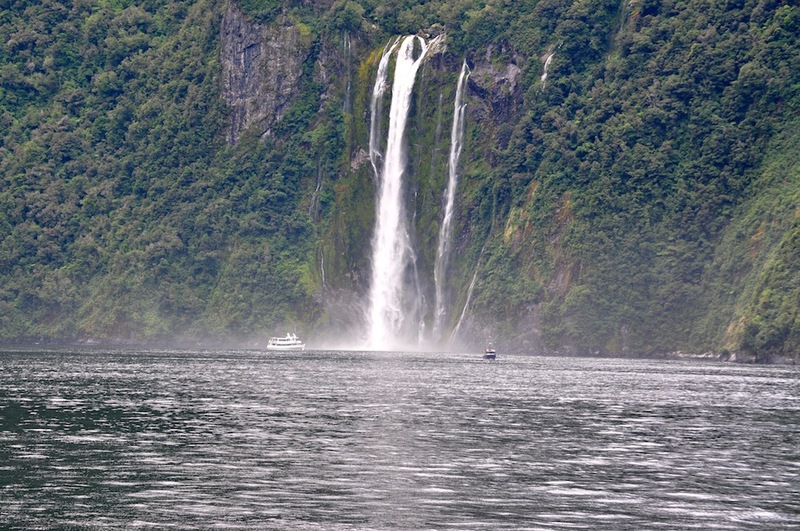 The most impressive of these were Stirling Falls, which send plumes of fine spray into the air, guaranteed to give you a soaking as the boats get as close as they can. The weather conditions prevented me from getting the classic photo of Mitre Peak but I am pleased with the almost black and white shots I achieved looking down the sound. I really wished we could have spent more time there, in fact more time in Fjordland, but it was not to be and our bus took us back to Queenstown, via Te Anau where we said goodbye to Paulette, fortunately without the commentary. Well, six days later we have had a detox; no caffeine or alcohol and lots of exercise. Hopefully a few kilos have disappeared, even though I have been carrying about 8 extra in my back pack. 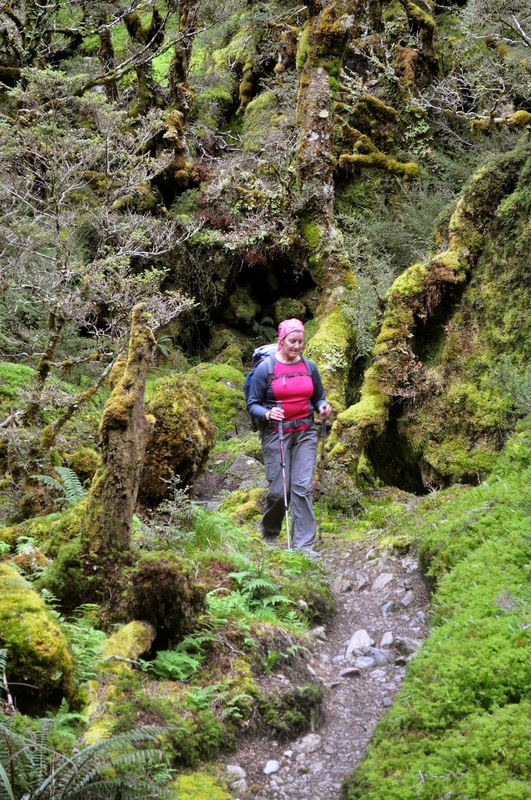 The Routeburn was a very varied trek, mossy green rain forest, swing bridges, waterfalls, rocky climbs and tantalising glimpses of snowy mountains. We had a lot of fun with new friends who have given us a warm invitation to visit them, or, at least, to keep in e-mail contact. Our Milford Sound cruise was enjoyable……….clear skies til we got to the open Tasman Sea then rain for the return. This is really a Fjord because it is an ancient glaciated valley by the sea and not a Sound, which is a flooded river valley. 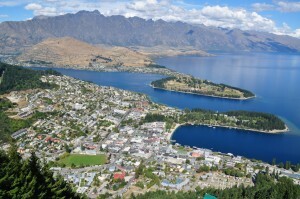 The 3 hour return bus journey to Queenstown was through beautiful lakeside valleys beside hilly ridges. In addition to the views we were treated to a movie, ‘The Fastest Indian’ starring Anthony Hopkins. The story of local hero Burt Munro breaking the land speed motor bike record in 1967. A gentle enjoyable tale. We ended this part of our adventure with fish & chips (blue cod of course) from Aggy’s Shack on the Waterfront in Queenstown. YUM! This entry was posted in New Zealand 2012 and tagged adult trips, New Zealand, Trekking, Trips by jwalton. Bookmark the permalink. Sweet pics! Can’t wait to catch up with you! John looks as if he is an angel at earland waterfall! Good to read your blog & know that both enjoying yourselves.